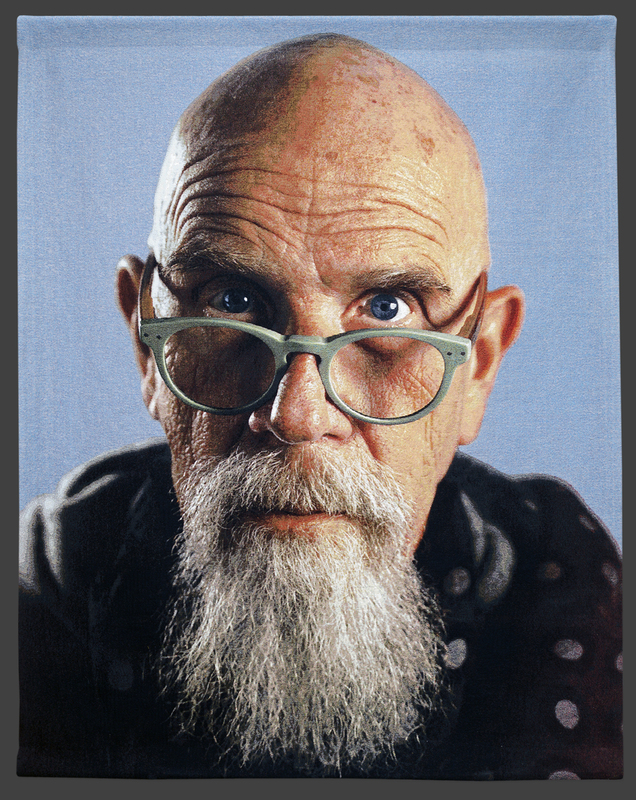 Chuck Close’s 2016 Self-Portrait (Jade Glasses) tapestry edition continues to draw attention to the artist’s evolving personal style, which has tended in the last few years toward bright colors and bold, all-over African prints. Instead of the low-key spectacles and crewneck combination of years past, Close appears here in a pair of eye-catching, mint-colored frames from a Brooklyn boutique and a polka-dot scarf purchased from a vendor on the streets of New York. Where the artist’s head loomed large in previous compositions, here the fullness of his beard — worn in the long, wizard-like style currently in vogue — dominates the picture plane.